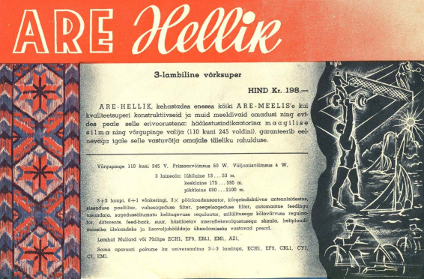 A page from the 1935–1936 RET catalogue. 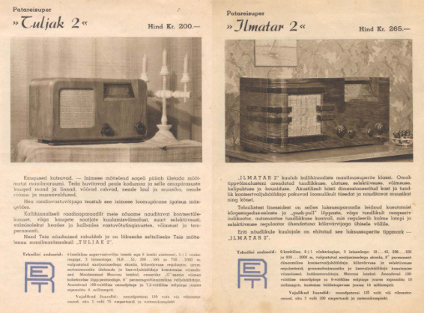 In 1935 a group of enthusiats decided to establish production of radio receivers in Estonia. Beccery shipyard, which was practically inactive at that time, rented its building located at Kopli 80 (today Marati 4). A manufacturing plant of radio receivers was opened in Tallinn, Estonia. 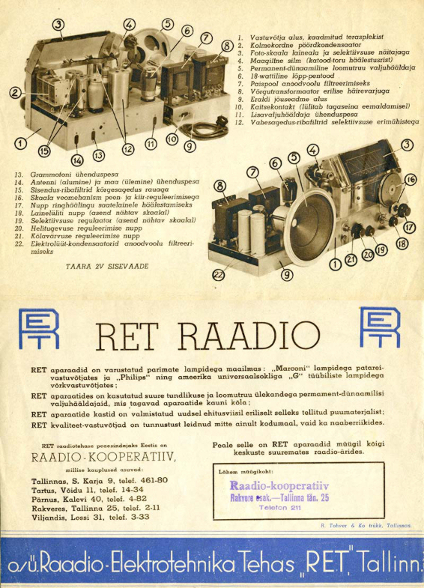 At the time, the factory was called RET (Raadio-Elektrotehnika Tehas). On 30 March 1935 O-ü. 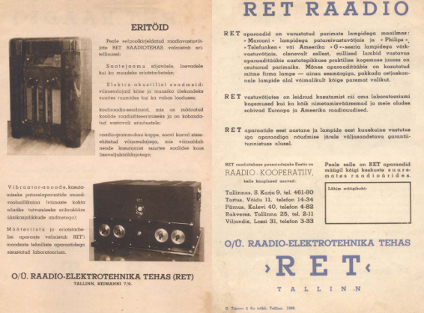 RET (Raadio-Elektrotehnika Tehas) received a license from the Ministry of Economics. The factory founders were Friedrich Olbrei, Karl Reinmann and Hans Võrk. Its activities description was stated as ‘development, production and sales of any radio, sound and cinema equipment, devices and other electro-technical components’. The Chamber of Commerce and Industry registered O-ü-. Raadio-Elektrotehnika Tehas (RET) with the initial capital of 35000 Estonian kroons in June 1935 at Suur Karja 9, Tallinn. The board of directors included Hans Võrk, Friedrich Olbrei, Julias Anton, Karl Reinmann and Reinhold Saving. Hans Võrk became the production director. 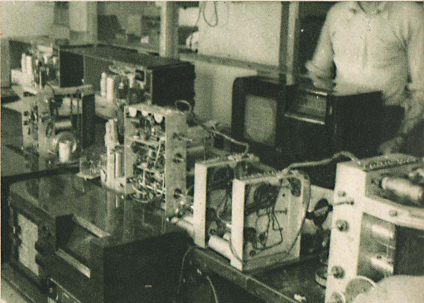 Firstly a labortary was established at the factory to start development of radio receivers. This was followed by equipping production facilities with at that time expensive modern machinery. Partly it was manufactured at the Arsenal factory in Tallinn. Some equipment was bought abroad. 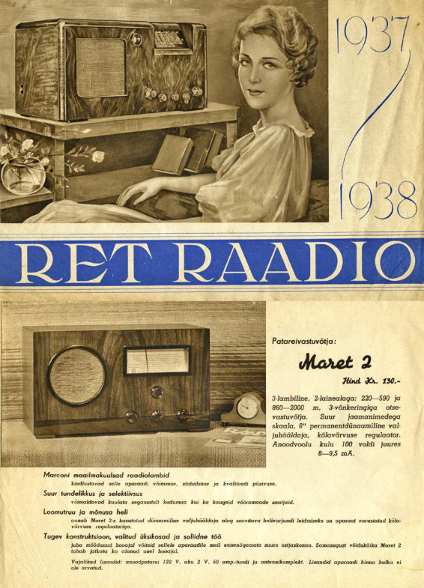 After hiring and training the staff the first RET radio receiver was released in September 1935. 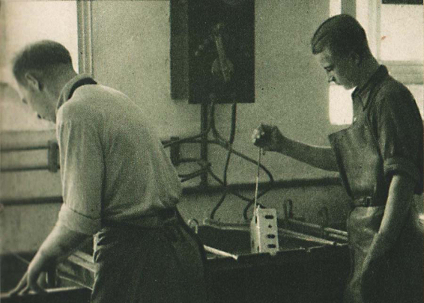 Cabinet production was established in December 1935. By this time approximately fifty people worked at the assembly line, which was powered by six electric motors, producing 20–30 radio receivers daily. On 13 December 1935 the 1000th receiver was manufactured. 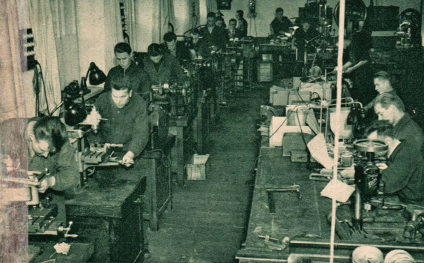 Overall during the first year of operation the factory produced 1156 radio receivers. This amounted to 10% of the total radio sales in the local market. 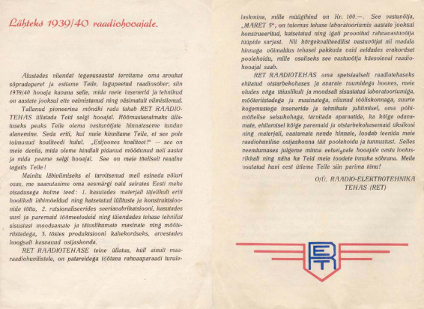 On 2 June 1936 OÜ RET received a permission from the Ministry of Economics to increase its initial capital from 35000 Estonian kroons to 60000 Estonian kroons. 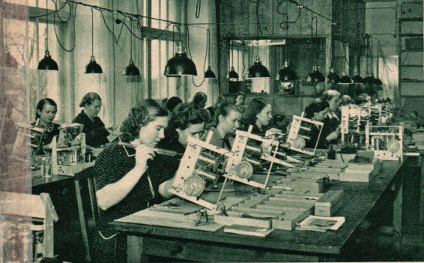 In October 1936 108 people worked at the factory including 35 females. 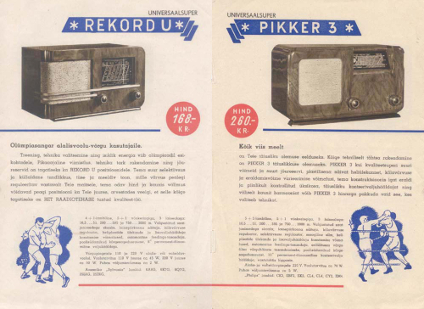 In the summer months employees were allowed to go on unpaid leave for 2–3 months, while the R&D department was developing new radio receiver models. Daily production output reached 30 units. 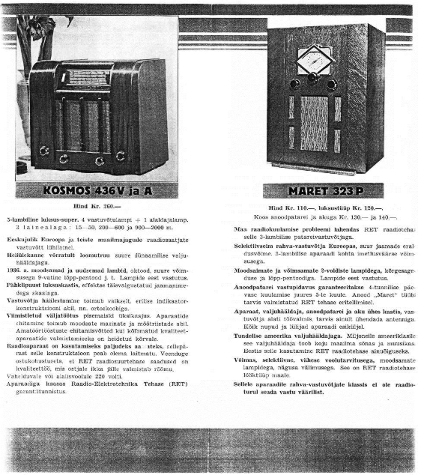 Overall during the 1936–1937 season 2061 radio receivers were sold, which was a 30% local market share. 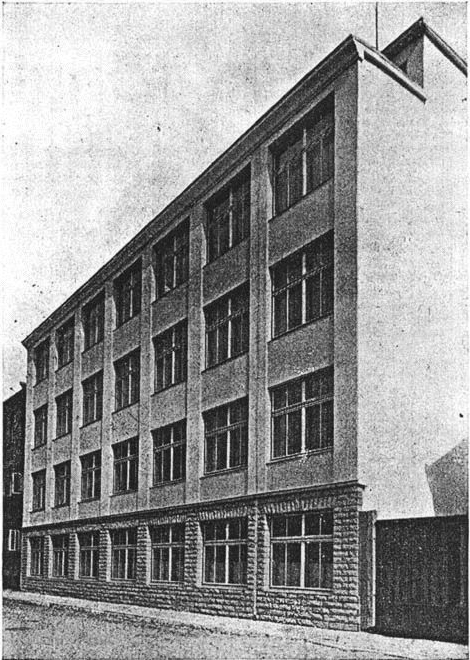 Estonian government decided that the Bekkery building, which RET was renting, had to be transferred to Tallinn Technical University. Due to this in 1936 RET bought a three-storey building at Reimanni 9 (today it is Ahtri 10). The neighbouring ground was bought later as well. On 23 January 1937 OÜ RET’s capital was increased to 120000 Estonian kroons. On 6 November 1937 company’s capital was increased to 250000 Estonian kroons. The factory was developing rapidly. According to directors’ calculations 120000 Estonian kroons had to be invested into building and equipping new production areas. New machines and measurement systems were bought. 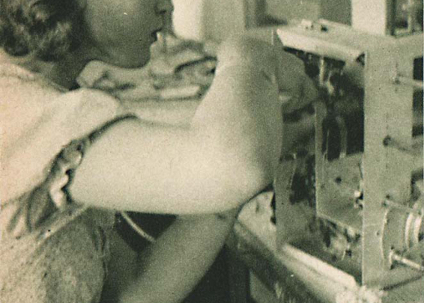 Technical processes were mechanised as much as possible. 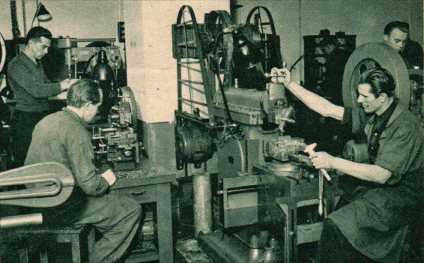 In February 1938 over fifty electric machines were operated at the factory. 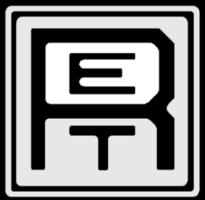 At that time RET was the first and the only company in Estonia with five specialised engineers and five technicians. In order to establish training of qualified workers a permission from the Sector Skills Council to assign fifteen factory workers, who had worked at the factory for three years, to a technical school or a radio school to raise their qualifications. In Spring 1938 construction of a new production building was started. Concrete technology, which had just appeared at that time, allowed a four-storey building to be completed in less than five months. 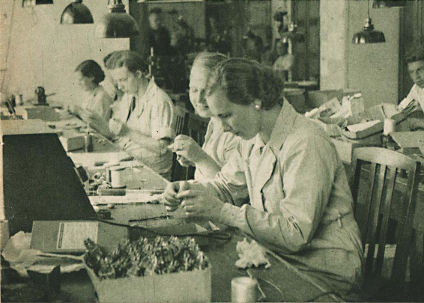 The new production department, which primarily employed women, manufactured inductors, voice coils, transformers and other wire-wound components. 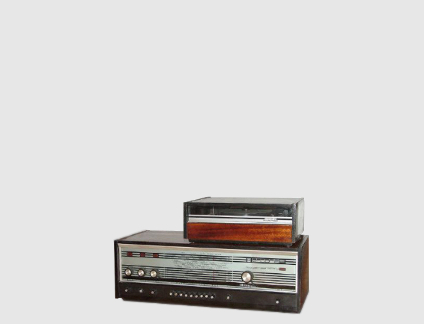 Furthermore special orders included radio-gramophones, amplifiers, radio equipment for schools, sound equipment for ships, transformers and inductors for radio stations etc. 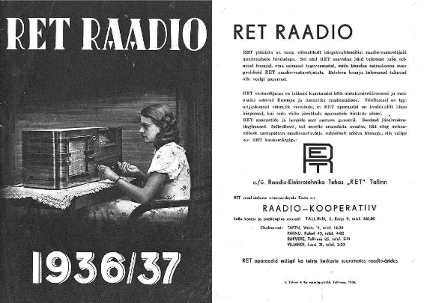 In February 1938 RET participated in construction of a few small radio stations. In 1938 RET employed 130 people. 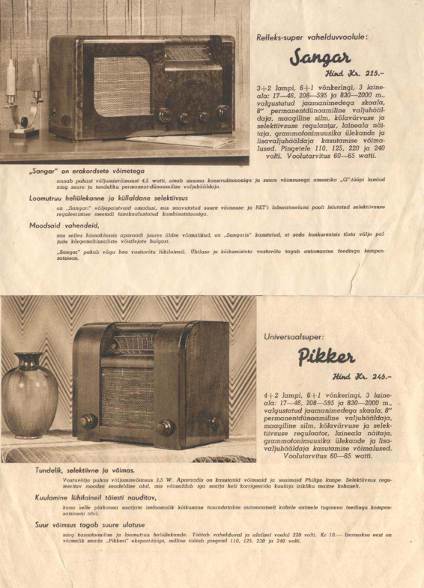 3348 radio receivers were sold in the 1937–38 fiscal year. In 1938 RET absorbed company Neon-Lux. Production of lighting equipment and neon signs was established. 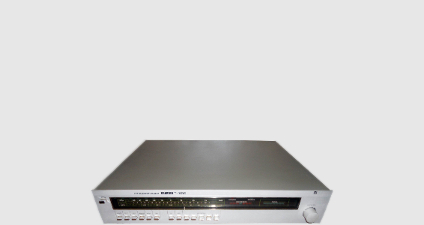 In addition to specialised custom equipment RET started manufacturing measuring instruments: signal generators, vacuum tube voltmeters, oscilloscopes, distortion analysers. 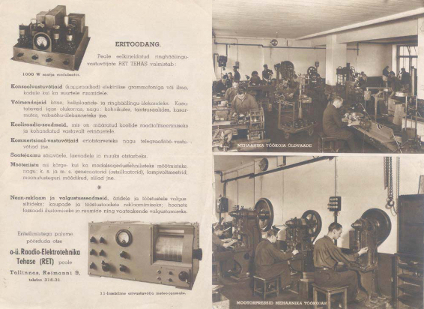 In December 1938 RET completed an order from Estonian Post to produce a radio transmitter for Kopliranna coast radio station. The cost of the equipment intended for establishing communication with ships in the sea was 35000 Estonian kroons. 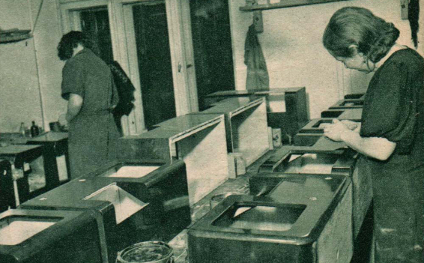 In 1938–39 the sales number increased to approximately 4500 units, and 200–220 people worked at RET. The best European and American components from such brands, as Marconi and Philips, were used in radio receivers. 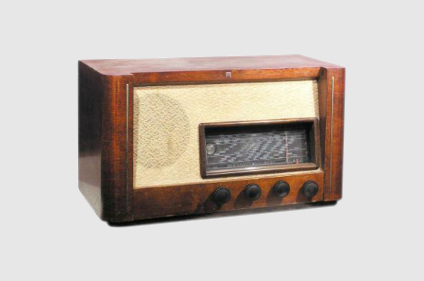 By December 1938 10000 radio products were manufactured by the factory overall. In 1940 RET employed 250 people. The factory used 75 electric motors with total power of 74.6 hp. OÜ RET shares were listed on Tallinn Stock Exchange. In 1940 OÜ RET was nationalised. Establishment of a new national corporation was planned to be based on RET. 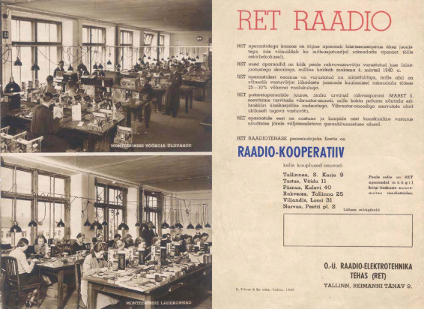 Radio department of Tartu Telephone Factory was transferred to RET. Their final merger happened on 28 November 1940. On 10 January 1941 electrotechnical factory ARE, which was located near RET at Reimanni 11, was merged to RET. 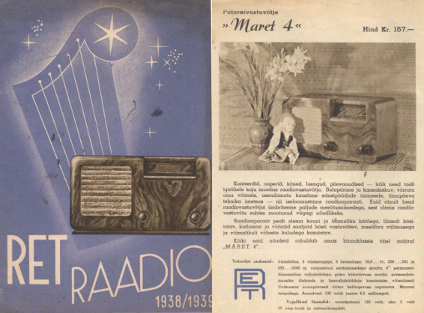 On 3 March 1941 radio-electro-technical factory RET was renamed Raadio-Pioneer. 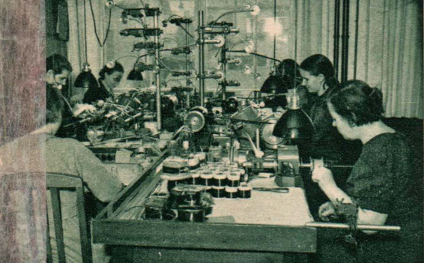 Assigned production plan stipulated manufacture of 18600 radio receivers and 70 radio transmitters in 1941, however because of the destroyed cooperations and lack of materials by 1 June 1941 only 3285 radio receivers were produced. All products in the first quarter of 1941 was made from ARE stocks, therefore radio receivers built at that time were named ARE. 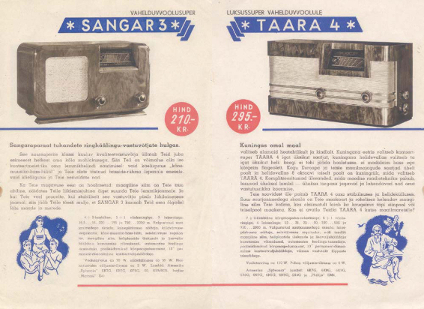 In the second quarter of 1941 modified RET radio receiver models were produced, which used tubes of USSR origin. 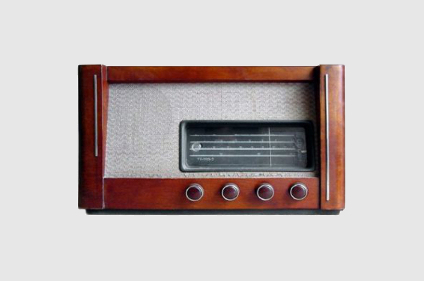 An eight-tube radio receiver was in development. 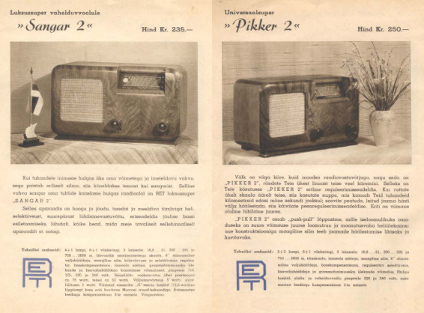 According to the factory’s acting chief engineer Eduard Kokker’s report from 1 June 1941 a batch of the first thousand of new Raadio-Pioneer models was started. 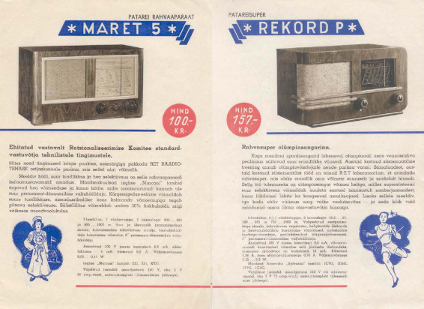 In terms of former products it was planned to release 300 radio receivers Rekord 2P, as well as some numbers of Ars 3, Malle 2, Sangar 5 and Maret 7. 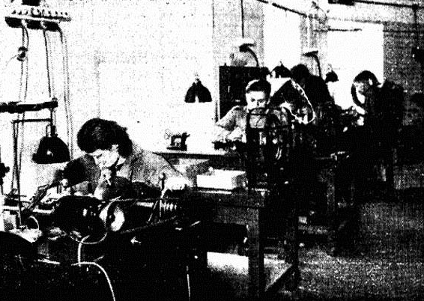 By 31 May 1941 285 people worked at Raadio-Pioneer factory. 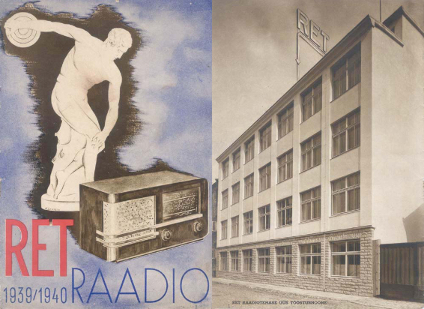 In 1941–1944 Raadio-Pioneer factory was passed to Telefunken and was renamed Funktechnische Fabrik Reval. Engineer Eduard Kokker was assigned as the managing director of the factory. He had an advisor, who represented Telefunken. 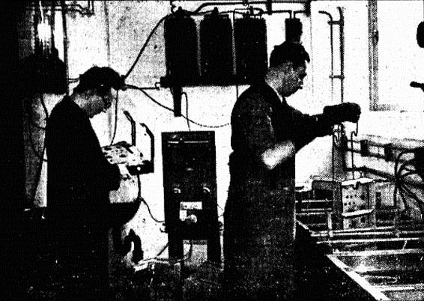 The factory was meant to produce radio equipment for German navy. VV-662 in the second version of the cabinet. After the World War II the factory was renamed Punane-RET. 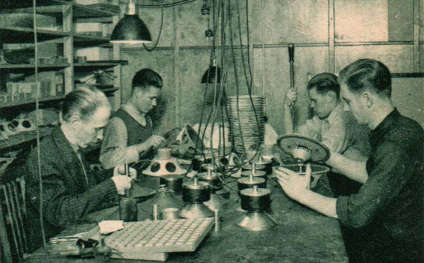 In 1945 production of radio receivers was reestablished at the factory. In 1945–46 only 372 units were released. In 1947 the quantity was 2127. 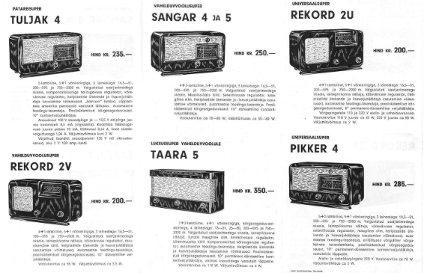 Initially four radio receiver models were produced. Besides this during 1946–49 the factory released 15742 receivers for the government radio network. 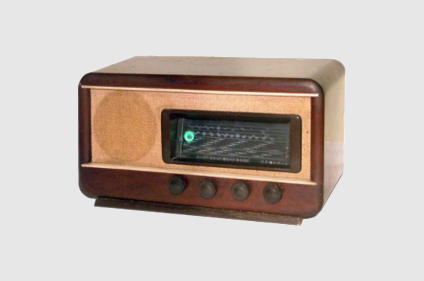 AC powered tube radio receiver VV-661 with 5 radio tubes was produced from 1947 until 1955. 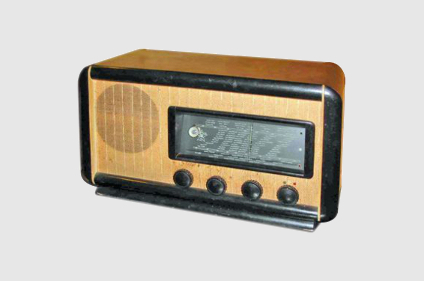 AC powered tube radio receiver VV-662 with 6 radio appeared in 1950. Its production ran until 1955 with two cabinet options. In comparison with the previous model radio reception qualities and acoustical parameters of the radio receiver were improved. 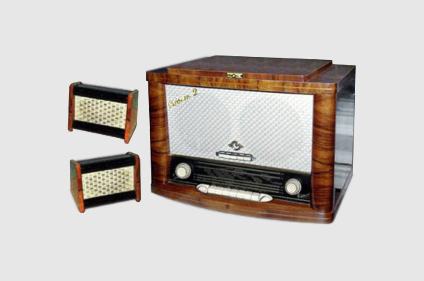 AC powered tube radio receiver VV-663 with 6 radio tubes was available from 1952 until 1955. It was an improved version of VV-662. 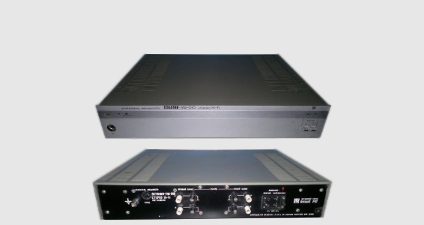 In comparison with the previous model all parameters of radio reception and sound quality were improved even more. VV-663 came with an option to connect an external electric gramophone. Later VV663-2 model appeared (in some versions named VV663 M). A new 3 W loudspeaker driver ДМ-II (DM-II) with a permanent magnet motor was used in this model. 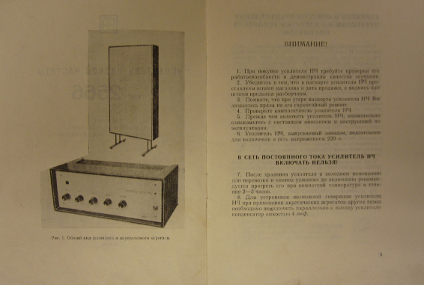 Previous models came with a 1.5 W ДЕ-I (DE-I) loudspeaker driver. 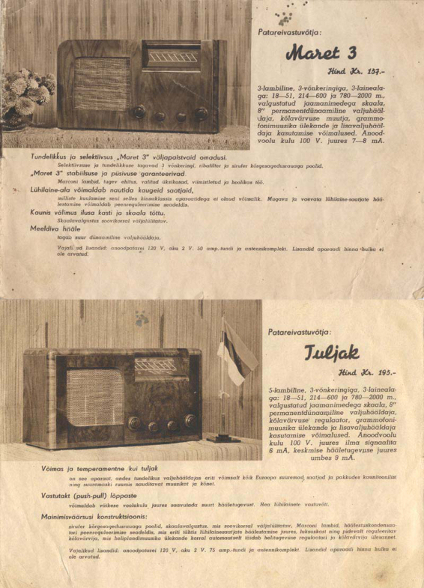 Between 1950 and 1952 the factory produced a four-tube battery powered radio receiver Tallinn P-2. Overall 16301 units were released. The design was based around bantam radio tubes. The receiver worked in long wave and medium wave frequency bands. It ensured confident reception of radio signals even with a room antenna. It had an option for connection of a gramophone tonearm. 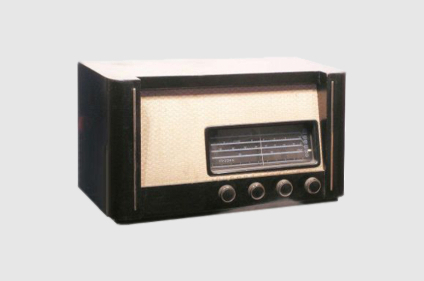 The radio receiver was DC powered from special batteries with low tension voltage of 1.2 V and high tension voltage of 90 V.
In 1951 a test batch of VV-462 was produced. It was an exact copy of Tallinn P-2 placed into a different cabinet. However its production was finished soon after. 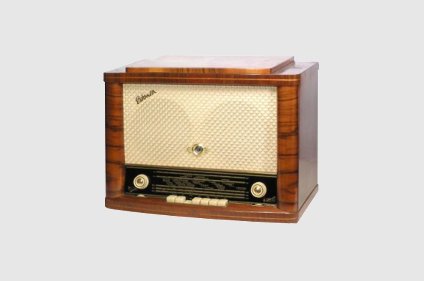 From 1955 the factory started releasing radio-gramophones: a radio receiver combined together with a gramophone. 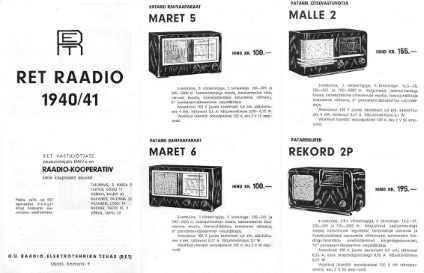 From this moment all RET consumer radio equipment was released under Estonia trademark. 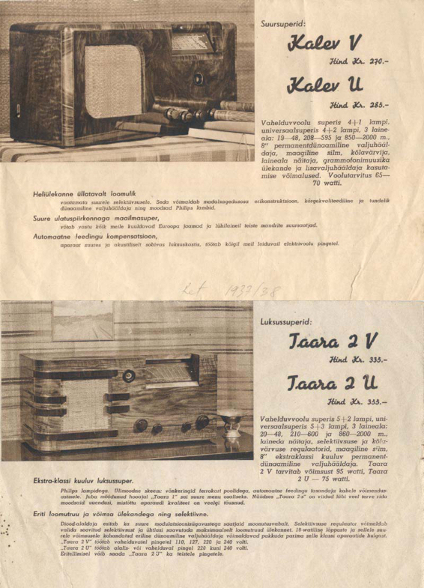 The first radio-gramophone model Estonia 55 (later simply Estonia) was available until 1959. It used 12 bantam tubes, selenium bridge rectifier, push buttons for band selection, 2-speed (33 and 78 RPM) gramophone with a piezoelectric ceramic cartridge and two sapphire styli. USW reception capability was added to the radio receiver, while the SW band was separated into five subbands. The loudspeaker system included two 6ГДР-1 (6GDR-1) drivers located in the front wall and two additional 1ГД-9 (1GD-9) tweeters located on the side walls of the cabinet. In that time radio-gramophone was comparable to European products of a similar level in terms of sound quality. Overall 40212 units were released. 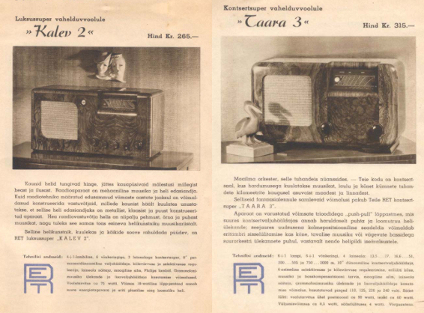 Radio-gramophone Estonia 2 was produced between 1958 and 1962. Overall 63861 units were released. The difference from the previous model was that the tweeters were placed in two separate cabinets. Provided their placement in a room was correct it became possible to achieve a considerably more pleasant sound in comparison with Estonia 55. In 1960 a branch factory was built in Jõhvi – Jõhvi Transformaatorite Tehas Tehasega Punane RET. Transformers for all RET equipment, as well as cable connectors and bundles were produced there. 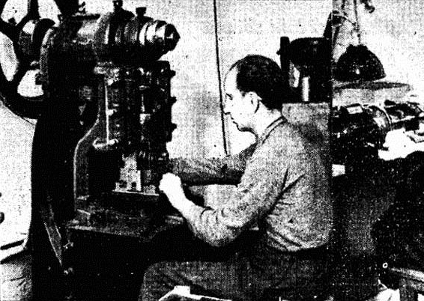 Furthermore a stamping department was established to manufacture stamped parts for radio equipment cabinets. 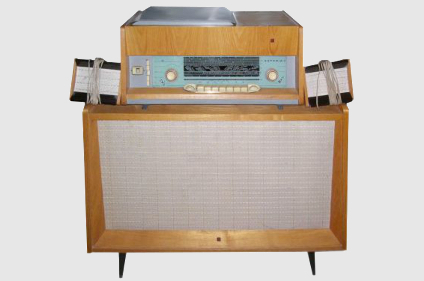 Radio-gramophone Estonia 3 was produced from 1962 to 1964. Overall 23717 units were released. It was based on Estonia 55, however it employed a new four-speed (16, 33, 45 and 78 RPM) gramophone. For the first time seminconductor diodes Д2В (D2V) were used as a high-frequency signal detector. The radio receiver had polar detector inputs for reception of stereophonic broadcasts.The loudspeaker compartment was completely separated from the receiver. 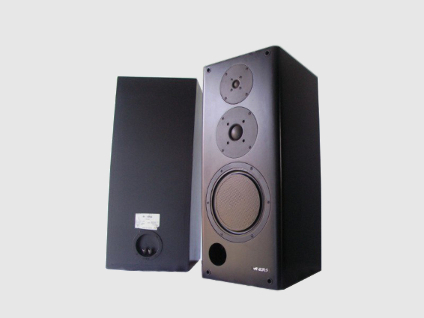 A 4 W loudspeaker worked in the frequency range of 60–15000 Hz. 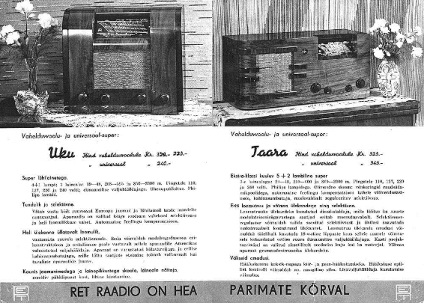 Radio-gramophone Estonia 3M was in production from 1964 to 1966. Overall 59224 units were released. It was a modification of Estonia 3 in a compact cabinet. The loudspeaker system is comprised of two 4ГД-7 (4GD-7) drivers. The use of separate high-frequency output transformers was abolished. Push button tone control was employed with options for ‘Voice’, ‘Solo’, ‘Symphony’, ‘Jazz’ and ‘Bass’. 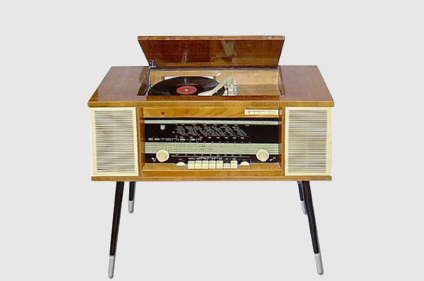 Radio-gramophone Estonia 4 was produced from 1966 to 1970. Overall 61683 units were released. 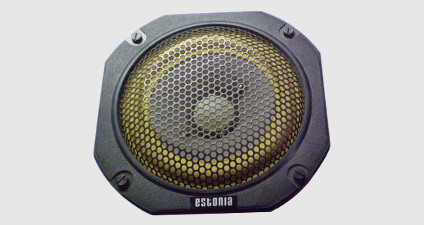 This was a modified version of Estonia 3M with a new cabinet design and a new loudspeaker system. 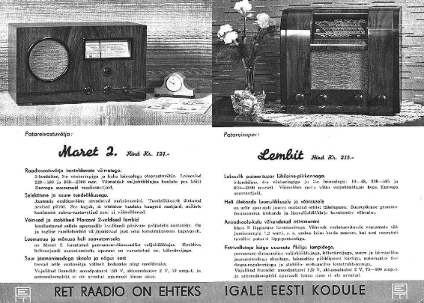 The export version of the radio-gramophone was released under Estonia-4E (European option) name. The models differed in frequency bands. 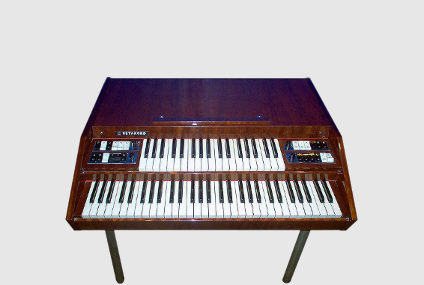 Besides consumer radio equipment the factory specialists designed and produced an electronic organ RETAKORD in 1966. The organ was supplied with a 25 W transistor amplifier RET 2566, which was based on a transformer design, as well as a special loudspeaker system. 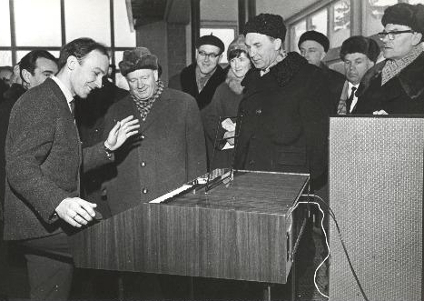 The designer of the electronic organ Heino Kalmo demonstrated RETAKORD at the spring trade show in Leiptzig. 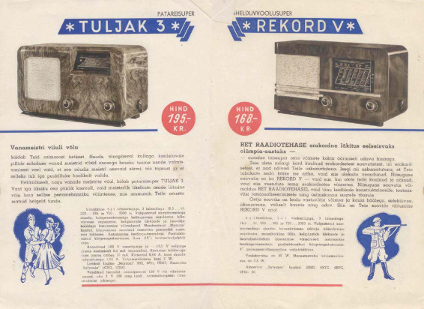 Stereophonic period for RET began in 1969, when Estonia Stereo was released. 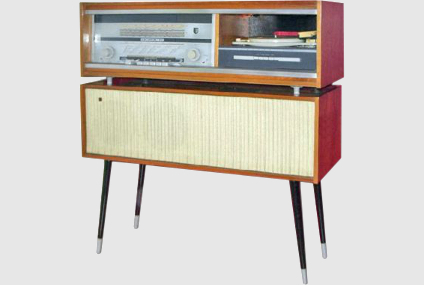 The modular stereophonic tube radio-gramophone was produced from 1969 to 1973. Overall 34474 units were manufactured. The main module included seventeen radio tubes. The gramophone worked at four speeds and employed a piezoelectric ceramic stereo cartridge. The system included a three-way floorstanding loudspeaker pair. 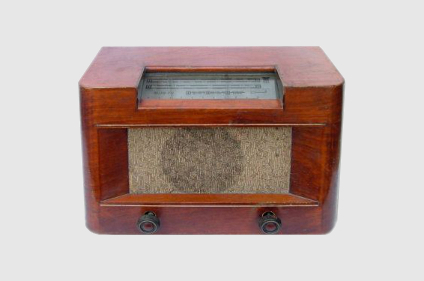 The radio-gramophone was equipped with push button switches, manual and motorised station tuner, automatic reception frequency fine tuning and a handle for manual steering of a loop antenna. 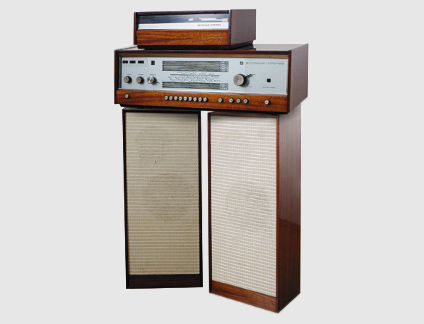 Modular stereophonic radio-gramophone Estonia 006 was produced from 1972 to 1978. Overall 94875 units were manufactured. 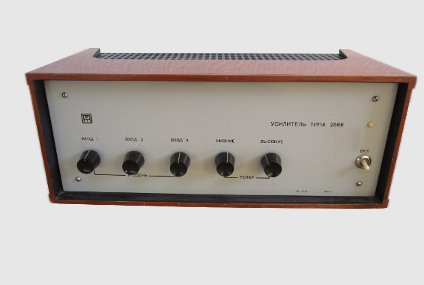 Reception module was similar to Estonia Stereo, however the power amplifier was based entirely on transistors. Motorised fine-tuning of the frequency was substituted by electronic. The radio-gramophone included small-sized bookshelf loudspeakers 10МАС-1 (10MAS-1). 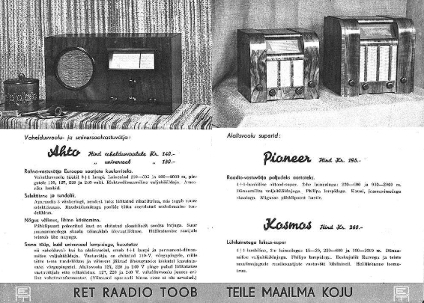 Fundamentally new radio-gramophone Estonia 008, based entirely on transistors, was produced from 1978 to 1982. Overall 45263 units were released. 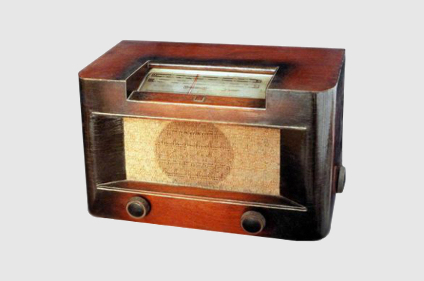 The radio receiver module was combined with the gramophone. 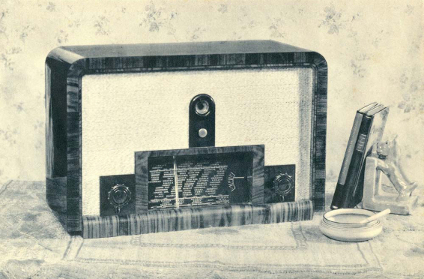 The radio receiver featured silent tuning and five fixed radio station presets. Sliders were used for volume, balance and tone controls. 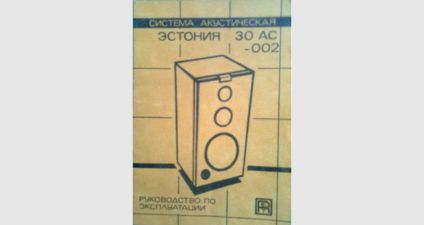 25АСА-II (25ASA-II) loudspeakers were active with built-in amplifiers. Control loudspeaker was placed in the main module. 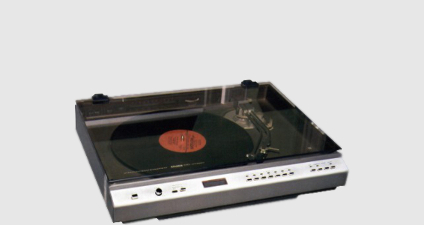 Radio-gramophone Estonia 009 was produced from 1981 to 1984. Overall 30436 units were released. Radio-gramophone was comprised of four modules. The gramophone module employed Polish Unitra G602, where an electromagnetic cartridge was used. The tuner-amplifier-radio receiver module was combined with a pre-amplifier. The set included two active loudspeakers 25АС-31 (25AS-31). 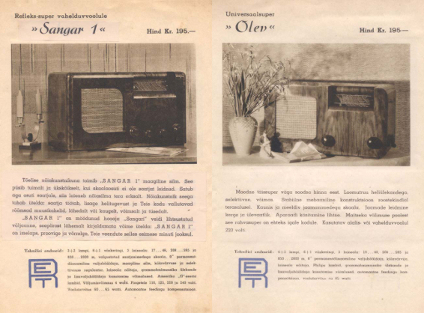 In 1980 a souvenir radio receiver Regatt was released to commemorate the Olympic yachting, which was held in Tallinn. 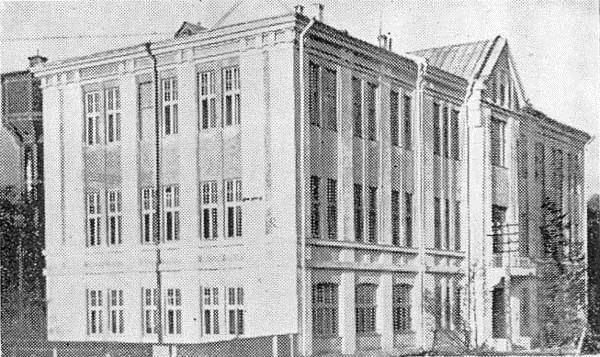 In 1985 production of loudspeaker drivers and assembly of loudspeaker systems was moved from the main Tallinn factory to the Jõhvi branch. At the same time many technological processes were modernised in partnership with Genelec Oy, Finland. 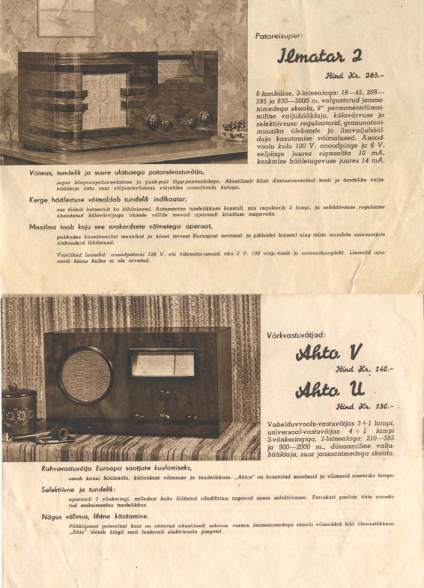 Modular stereophonic radio-gramophone Estonia 010 was a copy of Sharp Optonic. It was produced from 1985 to 1992. Both selling of a complete set, as well as in separate modules was intended. 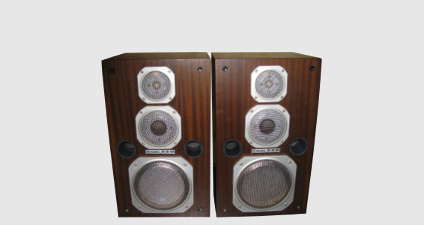 At first the set included active loudspeakers, however production of a power amplification module and 35 АС-021 (35 AS-021) loudspeakers was started in 1985. Loudspeakers Estonia 35 AC-021 (35 AS-021) were three-way systems with a honeycomb woofer, a dome midrange and a dome tweeter. They were produced from 1985 to 1990. Overall 73398 units were released. Estonia 35 AC 021-1 (35 AS 021-1) was available as well. It lacked protective grids over the midrange and the tweeter. The drivers had round flanges. Power amplifier Estonia УМ-010 (UM-010) had the output power of 2 × 85 W. Operating status and overload were displayed with LED indication. Overall 34896 units were released. 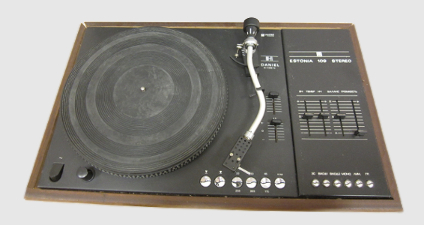 Estonia ЭП-010 (EP-010) was a low-speed direct-drive turntable. All modules used tactile switches. Special optical system was able to find the required track number on a record. It was possible to put on a replay a single track or an entire record. Overall 29762 units were produced. Estonia УП-010 (UP-010) preamplifier featured LED indication of available selections and of the output signal level, high-pass and low-pass crossovers and an output for headphones. Overall 35347 units were released. 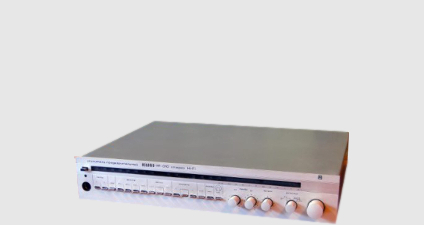 Tuner Estonia Т-010 was designed for reception of radio signals in SW and USW bands. 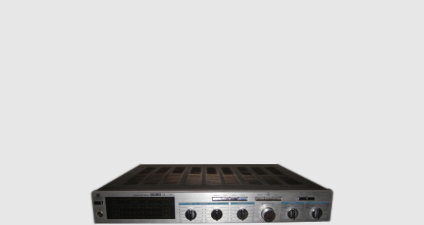 It featured digital tuning indication and an electronic frequency tuner. Automatic frequency fine-tuning switched off automatically once the tuning knob was touched. Overall 13121 units were released. 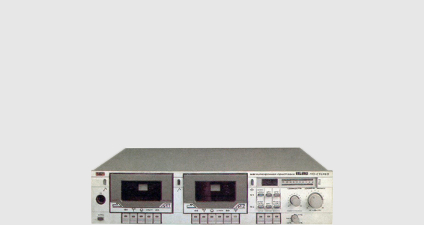 From 1986 to 1989 RET was the first to establish production of CD players in USSR. The product name was Estonia ЛП 001 C (LP 001 S). 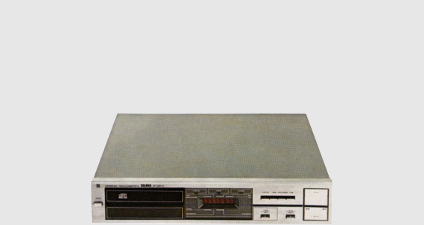 The player was equipped with Philips CDM-2 mechanism and TDA 1540P DAC. Electronic PCBs were supplied by Tesla, Czech Republic. Technically it was a modification of Tesla MC900. Overall 2454 units were released. Besides this a number of other consumer electronic products were manufactured in the 80s in small batches: an integrated amplifier Estonia 35-016 С (35-016 S) with the output power of 2 × 35 W featured modular design, which was not successful because of a large number of low quality connectors; a dual cassette deck Estonia МП-110 (MP-110); a stereo tuner Estonia T-110 С (T-110 S); a turntable Estonia 109, which had an integrated amplifier and was equipped with a Polish device Unitra Daniel G1100 fs; loudspeaker drivers Estonia 35 АС (35 AS) for cars. 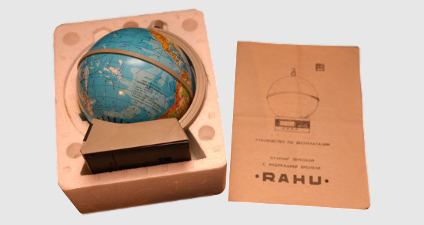 Souvenir radio Rahu was a receiver, which worked in the MW band. It was produced from 1986 to 1992. 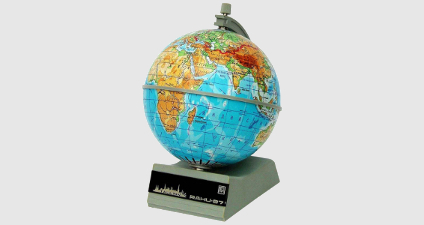 It was based on the souvenir Regatt, where the top sphere designed as a globe enclosed a loudspeaker. 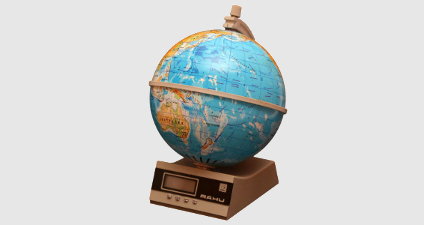 Tuning of the radio receiver was performed by rotating the globe. The second version of Rahu featured an alarm clock built into its base. 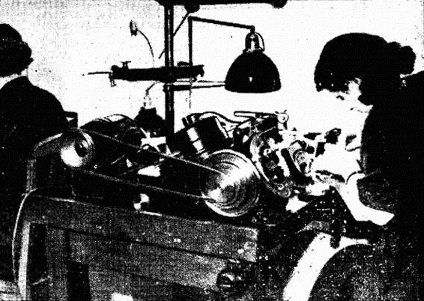 In 1985 production of drivers and assembly of loudspeakers was transferred from Tallinn to Jõhvi. At the same time manufacturing was modernised in a joint effort with Genelec OY of Finland. In 1992 Estonia was rebranded as Audes (‘Audio from Estonia’). 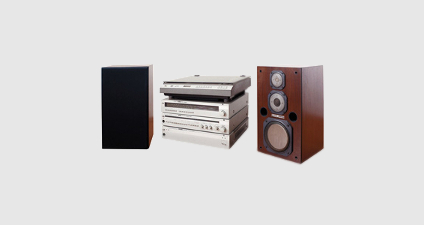 In 1993 Audes established its own production of loudspeaker cabinets. Initially the cabinets were made from chipboard. The first loudspeaker model, which was released under Audes brand, was 130AC in a number of modifications: 130AC, 130AC 002 and 130AC 003. The models differed in finish. Besides this 130AC 003 used a honeycomb woofer, while the other two models used woofers with paper-based cones.